A newsletter subscriber sent information about a positive innovation taking place in Canada. It’s worth hearing about. The Peace by Chocolate factory has been built into a worldwide social enterprise in Antigonish, Nova Scotia by Syrian refugees, the Hadhad family, after their Syrian chocolate factory was demolished. Their chocolate bars are inscribed with Peace in several languages, including Arabic and Mi’kmaq, a local indigenous language, and have the tag line One Peace Won’t Hurt. Find out about the initiative at www.peacebychocolate.ca. If there are great stories from your region that you feel need to be shared, send details to info@aipractitioner.com. Update from Peace by Chocolate. 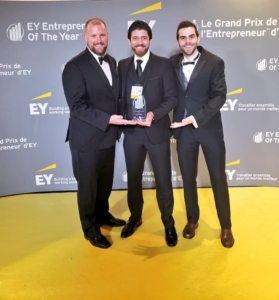 The company was a finalist in the Atlantic Region EY Entrepreneur of the Year 2018 Awards and named Google Canada National Hero Case for 2018. Clearly they are doing something right, with passion.